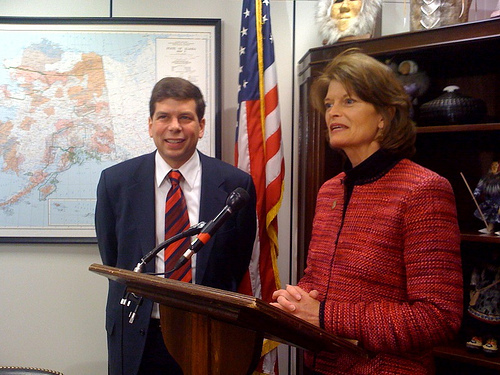 Senators Mark Begich and Lisa Murkowski. In the U.S., the only Arctic country without a national policy for the region, there are stirrings in the Senate about drafting one. Senators Lisa Murkowski (R-Alaska) and Mark Begich (D-Alaska) co-wrote a letter (PDF) to President Barack Obama, citing the “less than organized fashion” in which Arctic policy-making has proceeded since the signing of National Security Presidential Directive 66 under President George W. Bush, in which the first outlines of a U.S. Arctic policy were put to paper. It is true that, as Murkowski and Begich point out, a number of government agencies — probably too many — are working on the Arctic, such as the Coast Guard, Navy, Department of the Interior and its multiple bureaus and the National Oceanic and Atmospheric Administration. Were an umbrella policy to be developed, these groups and the numerous others that contribute to research and activity in the Arctic could coordinate their actions whether on offshore oil drilling or environmental conservation. The U.S. would also be able to present a more unified front at the Arctic Council, which will be especially important once it assumes the chairmanship in 2015 following Canada’s tenure. The American Navy may be the largest, but it has no active heavy duty icebreakers. American naval power is not guaranteed, either. To hedge against that, ratifying UNCLOS would grant the U.S. security in having regulations and standards that do not depend on the size of a country’s navy. It would be hard for the U.S. to enforce sovereignty in the Arctic — let alone carry out normal search and rescue duties — without a capable navy and coast guard, and even harder without ratifying UNCLOS. This statement provides a direct rebuttal to Inhofe’s claim that the U.S. can ensure freedom of navigation through naval power. In places like the Arctic where so many parties have a stake, from South Korean fishing trawlers to American oil companies, it is much more reasonable, cost-effective and efficient to manage disputes through diplomacy rather than resolve every incident with ships and sailors. The testimonies of all three witnesses can be viewed and read here. Ratifying UNCLOS would give the U.S. a framework within which it could develop its Arctic policy as well. For now, it’s hard to define what America’s strategy should be up north when the U.S. does not subject itself to international laws that every other country in the Arctic follows and when the U.S. prefers to resolve situations off the cuff. For further reading, I recommend this paper on the Arctic policies of the U.S. and Canada, which the Stockholm International Peace Research Institute recently published.